What if you are no longer a citizen of a State? What if ‘citizenship’ has devolved from a binary, to an analogue, status: no longer something you have, or lack, but rather something contextual, more fluid, and perhaps multi faceted. Today, i want to explore the notion of the ‘Citizen of Brand’, an exploration of my earlier work around the emergence of the transnationals, the evolution of modes of social organisation, and the new social realities empowered by the ground truths of the Social Age (specifically, the rise of social communities, the fracturing of old social contracts, and the rebalancing of power between formal and social systems). Consider the Nation: geographically defined, culturally distinct, governed or owned, visible. Historically, nations have changed either directly, by altering either their geographical, or their cultural makeup (conquest or genocide), or indirectly, through cultural pollution (e.g. through the import of pervasive media imagery), diversification, technology, or social revolt. Nations typically offer only a direct voice to a few, with most of us relegated to indirect power, through systems of government and devolved authority. And they offer us protection: a nation must protect the few as well as the many (although it’s definition of just exactly who ‘the few’, or ‘the many’ are has always proved a fluid and often disingenuous measure). If we are accepted into, registered within, a nation, then we are a citizen. Geographical proximity is not enough: citizenship is an honorific, or occasionally marketable, token, awarded, or removed, by established power. And nationhood has become something culturally normalised: you ‘have’ to belong. Indeed, a nation cannot deprive a citizen of citizenship unless they can conveniently be ‘exported’ to another space. We live in a strange global acceptance of the need for tidiness. But what if ‘citizenship’ itself is evolving, in the context of the broader shift into the Social Age? What if ‘citizenship’ is no longer something defined purely by geography, or culture? What if citizenship can be subscription based, rather than honorific? Or what if it can be honorific, but beyond the award of a geographically defined nation? 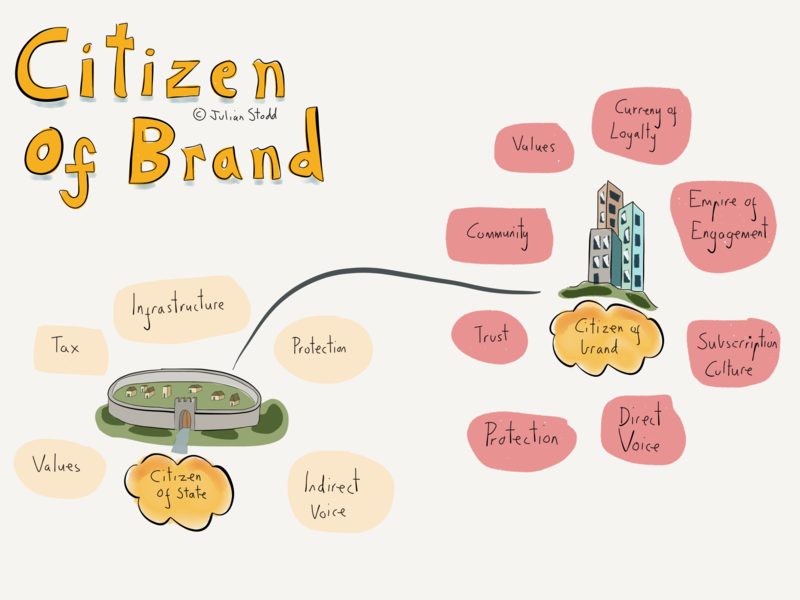 What if we can become citizen of a brand? A Citizen of Apple. A State of Lego. To appreciate change, we sometimes need to change the lens: we are used to people being citizens of a state, and loyal to brands, but what if there’s been a functional shift? After all, in the wider Social Age, we see things that were once singularities becoming spectra, such as ‘ownership’, ‘employment’, and ‘trust’. I’m less sure about trust, but in this, part of my 1% work, i can play with that idea. What would a Brand Citizen look like, compared to say being a Citizen of the UK? Start with empires: in the legacy world, empires were geographical, measured empirically, by square miles and headcount. But the Empire of Engagement is something entirely different. It’s an empire of colonised thinking, willingly adopted, dispersed, qualitative, and fluid. It’s a willing conquest. Take Lego (or Legos, for my inexplicable American friends). I love Lego. Yes, this is where i admit that i still buy it, enjoy making it, and avidly follow the release of each new set. So what does ‘Lego’ mean to me, and what may it mean in the future? Am i loyal to brand? Yes, but more than that, i’m part of a community. Lego itself has not been blind to this: the ‘Creator’ community not only ‘builds’, but can suggest new models, and i, as a citizen, sorry, member, of that community can ‘vote’ for the ones that i like. Nothing particularly new here: plenty of organisations are experimenting with crowdsourcing innovation. There may be a convergence at play though: Kodak, like others, is looking at using it’s spare power generation and space to create a cryptocurrency, a blockchain for loyalty. Store Loyalty cards may themselves evolve into cryptocurrency frames. There’s a women’s network in Bristol, using a cryptocurrency to effectively hold distributed reputation. Quantified trust. What if Lego builds a cryptocurrency of innovative engagement? It already has a community, but as that community expands, if we add in currency, we move towards more recognisable forms of society. What if the community forms a hierarchy? This week i’ve been working in two Fellowship networks, both of which are effectively semi structured reputation based social hierarchies, holding power through consensus, and developing sub political power. But simple membership is not society. What about culture? Apple has made a play here, building on it’s already strong ‘counter cultural’ reputation, by moving creatives into the heart of it’s retail experience. When i visited the Covent Garden store last weekend, my sense was not one of walking through functionally specific aisles, as i would in a grocery store, but rather through creative parks. Whist i was surrounded by iPads and MacBooks, there seemed to be little effort to actually sell me one: instead, what was on offer was community, learning, companionship, enablement. One iPad invited me to join a photowalk, another a chance to learn more about art. At the moment, these efforts are semi fragmented, but not entirely abstract: one of Apple’s greatest triumphs was to emulate Starbucks as a third space, but not the Starbucks third, a different third place entirely. It’s always been clear that a visit to an Apple store is more a visit to a shrine than a retail one. It’s a place of homage and tribute, perhaps much as a visit to a coffee shop is not purely one of survival, but rather one of self actualisation, identity, and invested hope. The religion of coffee. Protection is something that will shift as the transnationals reground their abstract power (which only really touches the ‘real’ world in conversations around taxation) into real geopolitical influence. Indeed, once that happens, the notion of nation will be fully corrupted. Already the majority of the worlds largest economies are not countries. They are companies. So what happens when they stage a takeover? I say that in jest: i don’t think for a minute that Amazon or Alphabet will seek to buy Jersey. They don’t need to. Their power is not anchored to geography: it’s anchored to imbued loyalty, and engaged community. When the early stages of the Trump administration started a conversation about rolling back certain civil liberties, it was the early transnationals that stood up and said ‘we will hold you safe’, something that has traditionally been the preserve of the nation. I’ve talked before about the erosion of some traditional aspects of nations: infrastructure, and tax. That was the old deal: government provides infrastructure, and i pay tax. One pays for the other. But today, much of my everyday infrastructure is not provided by government at all, or at least not in any direct sense. It’s Microsoft, Amazon, Netflix, Facebook, and Google, who provide much of my new landscape, my most important communication infrastructure, and my most direct engagement to my community. And then enter Bezos, itching to lay the Hyperloop in the real world, colonising with infrastructure. This shift leaves us in a fascinating space: on the one hand, the nation gives me infrastructure for tax. And organisations give me utility for subscription. In some ways, the value of the former has degraded, and the value of the latter is enhanced. So the picture is already occluded, confused. Imagine a future state, one of multiple citizenships, so i can be a Citizen of the UK, a Citizen of Apple, and a Citizen of Lego, not traversing physical borders to move from one to the other, but rather conceptual, or internalised ones. Each providing real utility, it’s own type of ‘space’, and each giving us it’s own component of culture. Perhaps in this model, ‘Culture’ becomes a meta entity that we each construct, through a combination of our geolocation within space, and our subscriptions online. Other changes will only accelerate this: we are likely on the verge of widespread disruption of education, and financial services, each moving to more portable structures, increasingly transnational. I suspect one of the big tech players will make a serious bid to offer a credible alternative to language learning, science, or sport. After all, what would you rather have: a PE instructor shouting at you to run around a field, or a connected system of sensors and contextual, individual, feedback, providing direct and effective performance support. And what would you pay for that? Our virtual spaces are democratized too, in unfamiliar ways: they give us a direct voice. The mechanisms of Social Filtering, and Social Amplification, mean that an individual’s voice can be heard directly, rather than through a devolved authority, which gives rise to more fluid and emergent types of democratic expression. Power itself is more contextual and fluid, so older models of codified political power, and indirect representation can be replaced by fluid Social power, and direct, socially moderated, representation. Maybe this is a fiction, but perhaps a fiction with kernels of truth. It was my own Prime Minister who said ‘if you say you are a citizen of the world, you are a citizen of nowhere’, but perhaps she was wrong. Perhaps she needed a different perspective, a new lens. Perhaps i am a citizen of State, but also a Citizen of Apple, a Citizen of the World AND a Citizen of Lego. Perhaps i am a Citizen of the Social Age itself. This entry was posted in Culture and tagged apple, Citizen, Culture, Lego, Longreads, Nation, Nationhood, politics, Social Age, State. Bookmark the permalink.